Orange Pi has been known for its several Raspberry Pi board clones and now has launched a better IoT focused board – Orange Pi 4G IoT. The Shenzhen based company, Xulong has gone through different modifications and even as at last year released a low-cost 2G based board – The Orange Pi 2G IoT board that cost just $9.90. However, recent trends have been gearing towards 4G technology, and some countries like Australia are already outfacing the old 2G networks. Therefore, it did not come as a big shock when the company released a 4G board recently. But it is clear that Shenzhen Xulong outdid itself as the board has a lot interesting and advanced features such as its 4G LTE module, fingerprint sensor support, WiFi, GPS and many more. The Orange Pi 4G IoT board is the most advanced Orange Pi board till date. Like many other Orange Pi boards, the Orange Pi 4G – IoT has a Raspberry Pi like footprint which measurements are 85mm × 55mm and a 40 – pin expansion header. 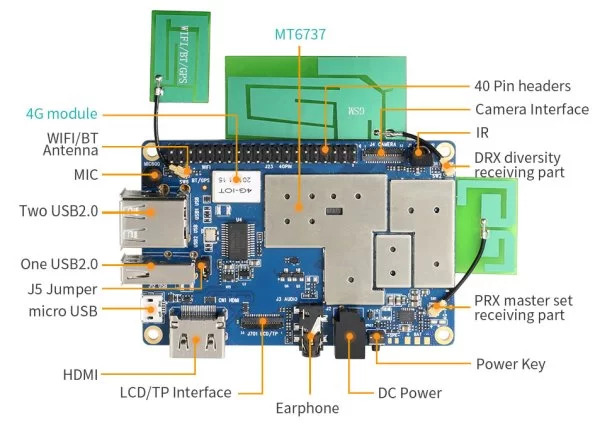 At the heart of the Orange Pi 4G IoT board is the MediaTek MT6737 SoC. The MediaTek SoC is a 64bit Quad-core, Cortex-A53 and clocked from 1.1GHz to 1.3GHz. There’s also a high-end, up to 650MHz Mali-T720 MP1 GPU with the SoC. The Orange Pi 4G – IoT Single Board Computer (SBC) runs Andriod 6.0 has a 4G LTE radio module with a mini-SIM card slot, a fingerprint sensor support and a combo module that includes WiFi, FM, GPS, and Bluetooth. There’s also a mic and an earphone jack. The board has a PRX receiver which could be a potential source for the fingerprint reader or a proximity sensor module. The Orange Pi 4G-IOT also includes a three USB 2.0 OTG host ports, a micro-USB port, and an IR receiver.